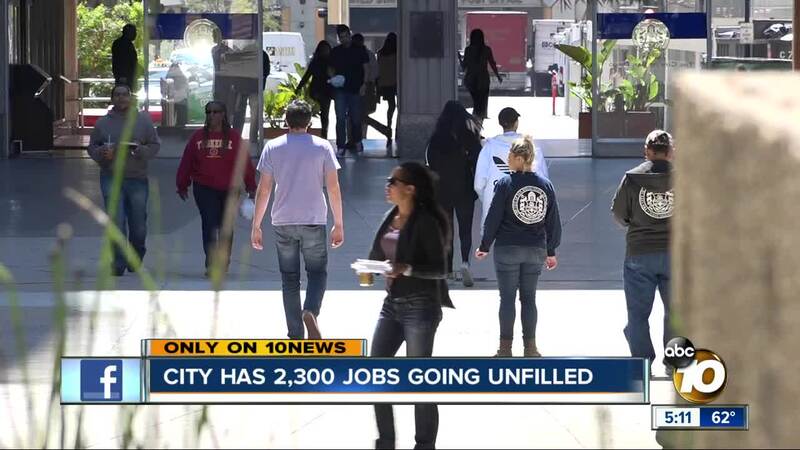 SAN DIEGO (KGTV) - The City of San Diego has more than 2,300 jobs vacant but is struggling to fill them. The jobs run the gamut from 9-1-1 dispatchers to water utility workers to swimming pool managers to civil engineers. The list of vacant positions came to light after the city Audit Committee discussed struggles with worker retention and recruitment at its meeting this week. "We need to do something about that," Councilman Scott Sherman said. "Change the culture and get it to where employees are really looking forward to going to work and like being where they are." Michael Zucchet, who heads the Municipal Employees Association, says the city is losing workers to other agencies in this county and others because they offer better pay and retirement benefits, such as a pension. He says the problem has gotten worse since the unemployment rate has dropped to a near-historic low 3.5 percent. The city in 2012 switched most new employees to a 401(k) style retirement plan after voters passed Proposition B. That proposition is now in legal limbo after the California Supreme Court said the city skipped a key step in the approval process. "The City of San Diego is hemorrhaging employees to other jurisdictions," Zucchet said. "We have documented people who have been city employees for a long time, have no interest in leaving, but they can't pass up a 20-30 percent pay raise in Chula Vista, Carlsbad, National City and these other places." Zucchet gave examples of current job advertisements showing accountants in Chula Vista making 20 percent more than those in the city of San Diego, senior management analysts in Encinitas earning 38 percent more, associate planners in Poway making 21 percent more, and a police service officer in Coronado makes 27 percent more. A search on the city's hiring website shows 53 jobs , but Zucchet said those positions reflect multiple openings. As of March 1, the city had 2,373 vacant positions, up about 8 percent from a year earlier. The city auditor is now investigating how the city can improve worker retention and recruitment. A July study found the city had an overall 10 percent turnover rate, but that it was 15 percent with millennials, who may be gaining experience at the city before moving on to higher paying positions.